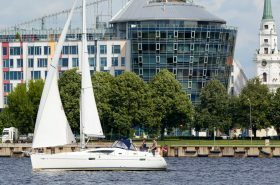 A yacht cruise to the Estonian island of Ruhnu is one of the most popular of our multi-day routes, largely because of the island’s special atmosphere and appeal. 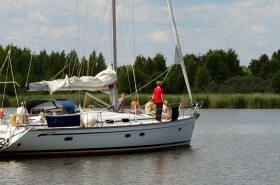 A 52 nautical mile long night cruise taking about 10 hours by yacht across the Gulf of Riga. 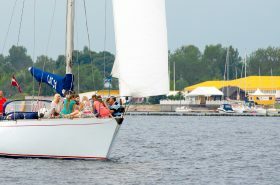 In the morning, during the period from 10:00-12:00 we will head back to the Latvian coast. We will arrive in Riga or Lielupe in the evening from 20:00-22:00. Other cruise plans are also possible. For example, we can plan a cruise for three days, sailing only during daylight hours. Or we can plan a four day trip and also visit Kuresaare on the island of Saaremaa) or the mysterious island of Kihnu near the Gulf of Parnu. A sea voyage by yacht to Ruhnu Island is special, because it combines the joy of sailing on an open sea and the exploration of new and interesting places. 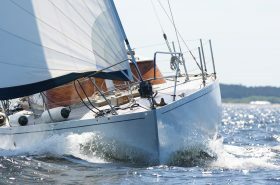 Domestic comfort on the yacht during the cruise and the impressions you gain on the way are largely dependent on the size of the yacht, the wind conditions and the conditions at sea. For cruises to Ruhnu Island you can choose from almost all of our yachts, ranging from the 9 metre long Carter-30 type yacht, which can accommodate four guests through to the biggest 43-50 foot yachts with 8-12 guests on board. 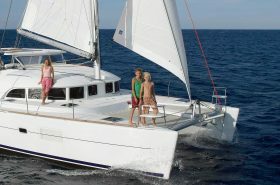 In turn, the catamaran Wild Cat 65 can carry up to 20 passengers on a cruise to Ruhnu Island. 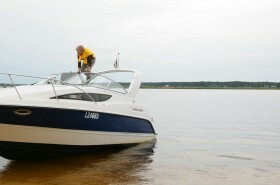 The number of passengers is largely determined by the number of berths available on board the yacht. If some of the guests are planning to stay overnight somewhere other than on board the yacht, then a larger number of passengers can be accommodated. On every long distance yacht cruise, there are invariably passengers on board who enjoy spending at least part of the night on deck, savouring the thrill of sailing at night and helping to helm the yacht. For their skippers, piloting a yacht is a routine and they are happy to have the chance to entrust their duties to passengers even if it’s only for a brief time. Likewise, the yacht skipper will happily show guests how to pilot the yacht, hold a steady course in relation to the wind and to ride a wave.  By the way, learning to helm the yacht is good way of coping with sea sickness (kinetosis) and its initial symptoms. Even sleeping on a yacht is special – swaying up and down on larger or smaller waves rocks passengers to sleep in a most pleasant way. 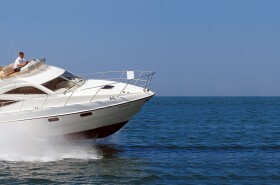 Depending on the yacht’s course in relation to the waves, guests can hear the chopping of the waves and each and every change in the yacht’s course can be sensed by the sound alone. This is complemented by the “canting” of the yacht, as well the action on deck including the steps of the crew, the clattering of the winches and the fluttering of the sails in the wind. What are the attractions on Ruhnu Island? The Estonian island of Ruhnu is approximately 5.5 kilometres long and 3.5 kilometres wide. The village of Ruhnu is literally the hearth and soul of the island, being the point where all of the island’s roads meet. For a small charge, you can hire a bicycle at the harbour. We usually hire these and use them to explore the island. Ruhnu Island’s St. Magdalena Church. Built in 1643, Ruhnu Island’s wooden church is one of the oldest wooden buildings in Estonia and the parts of a shipwrecked vessel were used in its construction. It still hosts the island’s most important church services. The church pews are angled to accommodate both adults and children. Seating on the right of the building is exclusively reserved for men, while the pews on the left are for women and children. Ruhnu Island’s New Church. At the start of the 20th century, at a time when there were over 250 inhabitants on Ruhnu Island and there was not enough room in the old church, a decision was made to build a new church. Thus, building of a new stone church began alongside the old wooden church in the centre of Ruhnu Island in 1912. It was blessed and opened on 20 July 2012. Ruhnu Island Lighthouse. At the highest point of the island, the Ruhnu Island Lighthouse rises up on Haubjerre Hill. The lighthouse’s stapled metal frame was built in 1877 and it was designed by Alexandre Gustave Eiffel, the very same Eiffel, who designed the Eiffel Tower in Paris and the Statue of Liberty in New York. The lighthouse was imported in pieces and assembled on Ruhnu Island. The lighthouse lamp stands 65 metres above sea level and is visible to navigators from a distance of at least 11 nautical miles from the island. Limo Beach and Limo Sauna. Limo Beach is located in the south-eastern part of the island, not far from Ringu Harbour. It is renowned for its singing sand, which is really white and fine, and resonates pleasantly under your feet. Limo is a truly wonderful and pleasant place on Ruhnu Island. The Limo Sauna was built right there on the bluffs by the sea itself. This is a small but modern guest house with a sauna and hot tub outside, while the view from the bluffs stretches as far as the expanses of the Gulf of Riga. The rental charge for the Limo Sauna is around €160 per night. Kuunsi Beach. The second beach on Ruhnu Island. Located at the northern top of the island with an ancient steel navigation tower on shore. The beach here is negligible, because the shore is covered with large stones. Here, visitors can often observe large flocks of cormorants. At the Ruhnu Island Ethnographic Museum, visitors can inspect work tools and household items that were once used by the island’s inhabitants. These include an 8,000 year old quartz instrument used by hunters on Ruhnu, and the dragon-headed weathervane that used to sit atop the old wooden church. Sauna at Ringsu Harbour. If you book in advance, the harbour administrator will heat up a small sauna on the spot in the harbour house. A visit to the sauna is included in the harbour charge. Comfortable showers and toilets are also available at the harbour. A ride in a hot bath. The natives of Ruhnu Island are an attractive people. On the trailer-cistern of an old tanker, they have installed a hot tub, in which they heat up water for tourists to bask in as they take an excursion around the island on the back of a tractor. Red bilberries. In autumn, the forests on Ruhnu Island are full of red bilberries. Freshwater whitefish. In autumn, these fish from the salmon family are frequent guests in the nets of the island’s fishermen. It’s usually possible to obtain some fish from the locals. If lightly salt them, you can enjoy them in sandwiches in a few hours’ time. It’s true delicatessen! Most yachts are fitted with a small galley (kitchen) containing a gas cooker (the cooker surface has a device to ensure that it doesn’t rock about in choppy conditions), sink, fridge and “large” dishes for cooking hot meals. Guests on board the yacht usually prepare meals for themselves and the yacht’s crew. This is the accepted code of conduct at sea. During the season, the port has a working pub, where you can enjoy a meal during the day. However, at weekends and on public holidays, the demand for meals from tourists visiting the pub can sometimes be so great that the pub runs out of food. It’s worth remembering this when planning the food stocks you bring with you on the voyage. If you’ve forgotten anything, there are two shops at the centre of the island where you can buy absolute necessities. What’s the best time to cruise to Ruhnu Island? The best time to plan a yacht cruise to Ruhnu Island is on weekdays. At such time, life on the island is calmer, because there are less visitors and more opportunity to enjoy Ruhnu Island’s inimitable charm. It’s particularly pleasant there at the start of September when the weather is still warm and there are significantly fewer people on the island. How much does a yacht cruise to Ruhnu Island cost? Depending on the chosen yacht, the price of cruise to Ruhnu Island ranges from €500 for a small 30 foot yacht for 4-5 persons up to €850-€1300 for 43-50 foot yachts for 8-12 persons. 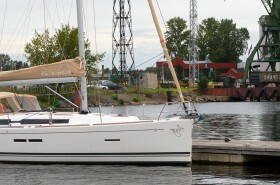 Usually, the price includes the yacht, skipper’s services, port fees and fuel. In order for your cruise to Ruhnu Island to be pleasant and safe for all passengers, the final decision before setting off for the sea will be made by the yacht skipper. This is related to weather conditions including the wind direction and speed on the chosen date. The weather forecast becomes almost totally reliable only 72 hours beforehand. When embarking on the cruise, you need to bring your passport or ID card, because Ruhnu Island is within Estonian territory.